In "Eyes of the Storm," book three in the epic BONE series, Gran'ma Ben reveals long-kept secrets about Thorn's royal heritage and the ancient enmities that may lead to war.In "Eyes of the Storm," volume three of the nine-book BONE saga, Lucius, Smiley, and Phoney survive an attack by the rat creatures and return safely to Lucius' tavern in Barrelhaven. 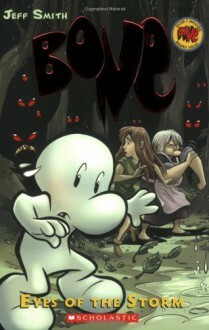 Phoney, desperate to win a bet with Lucius, stokes the townspeople's fear of dragons and boasts that he is a professional dragonslayer.Back at the farm, Fone Bone and Thorn are troubled by strange dreams, and Gran'ma Ben's reaction to them is stranger still: She reveals long-kept secrets and warns of great danger. Thorn, Fone Bone, and Gran'ma Ben may have to leave the farm forever.